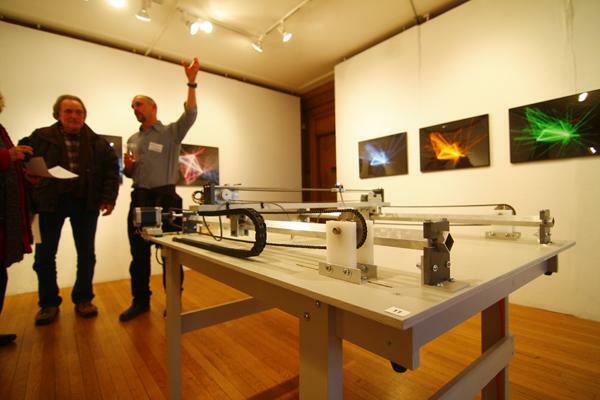 University of Illinois professor and sculptor Stephen Cartwright shows laser mechanism which he has used to transform years of global positioning system recorded data into photographs. University of Illinois at Urbana-Champaign sculpture Prof. Stephen Cartwright originally used his global positioning device to create an “old lady’s map” to track the traveling habits of seniors. More than a decade later, Cartwright has recorded about 125,000 hourly entries into his handheld global positioning device, tracing his own traveling habits and transforming the data into art. Cartwright showcased his work Sunday at the Evanston Art Center, as part of the center’s Evanston + Vicinity Biennial Solo Shows with two other artists. Chicago juror Shannon Stratton selected three artists from a group of 47 to present at the Solos shows from online submissions. All of the artists who presented were sculptors. “It’s just appealing to look at, I’m not so sure if it has some meaning … if (it means) another revolution is coming, but it is worth looking at,” Evanston resident Alan Birman said of one of sculptor’s work. Chicago artist Scott Carter created a band instrument set out of drywall and other construction material. After demolishing the guitar and drum set during a recording, Carter built up the instruments again for the show. Evanston Art Center executive director Norah Diedrich joked that Evanston residents would have to sign safety forms before demolishing the music set toward the end of the solo shows. In another room with a hardwood floor, pieces of plywood were clamped together and twisted into loops. A lone broomstick leaned against one of the sculptures. Diedrich said the pieces are representative of an interdisciplinary movement in art which incorporates themes from music, space and movement. The Block Museum of Art uses such an interdisciplinary approach, she said. “It’s a lot more porous the way people are working,” Diedrich said. She said she hopes to work with Lisa Corrin, the director of the Block Museum who was chosen last year. The show will run until April 7. The center will invite the University of Hip Hop in May to talk about graffiti writing as a cultural movement.